"The friendly place to meet and worship." Worship: Sunday - 10:30 a.m.
Mayflower Church welcomes all people who love God. As Congregationalists, we are descended from the Pilgrims who came to this country to worship God in their own way, and we continue to follow this tradition. We do not ask about anyone's politics, and we do not tell them how to pray. Our only "rules" are that we love God and sincerely try to love our neighbor as ourselves. We would be very happy to have you visit us. • The next Second Saturday Supper baked-chicken dinner is May 11, 2019 from 5:00 - 6:15 pm. • Women's Bible Study - "Women of the Bible" 10:00 a.m. on Wednesdays. • Mayflower is available for weddings, receptions, meetings, or other social events. We also have a commercial kitchen available. See Forms & Information for details, or call (517) 484-3139. • Follow us on Facebook! If you can't be with us in person on Sunday mornings, view the service in real time via Facebook Live video streaming, or watch later at your convenience here. And remember to "LIKE' us on Facebook to get notifcations of the Live services. • For other weekly news and announcments, listen to our worship service on the 'Sermons & Audio' page. You may also get weekly news updates via email. Call the church office to be added to the email group. • Got Prayer??? Visit our Prayer Request page or contact the church office. We receive (and pray for) requests from around the world... and, we have upgraded the online request form. Check it out. 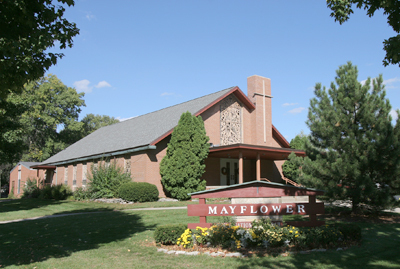 'LIKE' Mayflower Church on Facebook and be a part of the Mayflower family. Mayflower Church... Come grow with us!